Quick travel tip: In a pinch, hotel shampoo beautifully doubles as bubble bath. I'd just employed this trick, almost too well (I always forget that the bubbles grow exponentially when jetted tubs are involved). I was lazing into the glorious depths of the two-person Jacuzzi, mellow and relaxed after our in-suite couples massage, not a care in the world. But also absolutely thrilled and barely containing my excitement at how well the day and evening were unfolding. An interesting emotional juxtaposition. Then the phone rang. Joe, still fully clothed and fiddling with Spotify on the laptop, answered. A few moments later, he poked his head into the bathroom: "They said someone is at our door with a gift." In any other scenario, that message would have kinda creeped me out. But this was our anniversary, and we were at Turf Valley. All was well. I uttered a few flustered "Thank yous" from the tub, kicking myself for missing out - which is difficult to do in a tub, given the water resistance. After Steve left, Mr. E brought everything in and set it up on the edge of the tub. It was a perfect pre-dinner indulgence. Few things in life feel fancier than sipping bubbly whilst among bubbles. Relaxed as we were, we had one more very important event planned: dinner at Alexandra's. We've eaten there many times, and we always end up saying to each other, "Wouldn't it be nice to be able to just go upstairs to our room now instead of driving home?" This was one of the reasons we decided to spend our anniversary at Turf Valley; to be able to indulge in that fantasy. Eric, our server, took such good care of us - we felt like royalty. 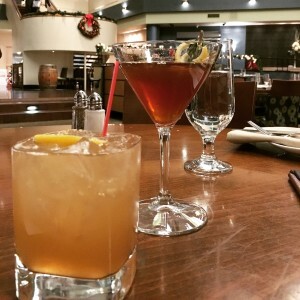 We sampled two of the seasonal cocktails: Mr. E got the Vocci's NY Shrub (named after the executive chef) and I, always a sucker for alliteration, ordered the Bumbled Bourbon. Both were delicious and tasted of the sultrier side of the holiday season. After appetizers of lobster bisque and crab-stuffed mushrooms, we each ordered a glass of wine to go with our entrees - a bold red to stand up to my filet mignon, and a buttery white to compliment Mr. E's scallops. Both entrees were decadent and delicious. My filet was perfectly cooked, and since I ordered it "New Orleans" style, I got to indulge in a side of rich and creamy crawfish mac and cheese. I had to force myself to save some for Mr. E, though I think he would have been perfectly content with his choice of entree. The scallops positively melted in your mouth, and the accompanying sauce and risotto were a nice balance of both the bright and the earthy. We were happy to oblige Eric in his recommendation of the Irish coffee crème brûlée for dessert (shh don't tell him but it was at the top of our list to begin with). It was positively, fantastically, there's-got-to-be-a-law-against-this-amount-of-deliciousness-somewhere scrumptious. The "crack" of the sugar crust was thrilling, and it kept going. Crack after crack of gloriously browned sugar. You could've skated on that sweet, sweet rink. We wrapped up dinner by ordering two mugs of hot chocolate to go - we have a tradition of drinking hot chocolate, preferably in front of a fireplace, wherever we go in the world. Shortly thereafter we retired to our room, where I polished off the champagne and turned on Food Network - yet another indulgence, since we don't have cable. It was a delightfully low-key ending to a Really, Really Nice Day. I've said it before, and I'll say it again. Going to Turf Valley and Alexandra's is an experience - their team does a great job of making a suburban Maryland hotel feel like a resort that could be anywhere in the world. And truly, even though we were only a few minutes from home, we felt a world away - just as we had hoped.